This was a famous victory and, coming so soon after the one-sided Cardiff Test, one that was scarcely predictable. There's no doubt that England were lifted by their escape there, and while Ricky Ponting denied that it had a negative influence on his team, it certainly cannot have helped. Indeed, Australia were as poor at Lord's as England had been at Cardiff  perhaps we are in for a see-saw of a series. 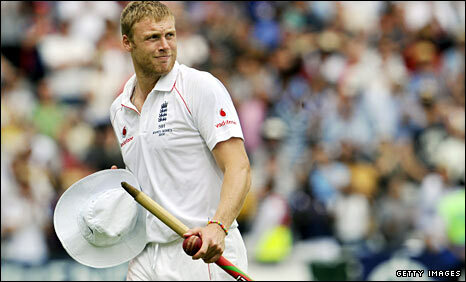 Andrew Flintoff's effort was awesome. Ponting had mused at the start of the game that Flintoff's retirement might become a distraction for England, but we knew he was clutching at straws. In fact, it has driven him to finish on the highest possible note  what more motivation do you need than to know that you are bowing out with the opportunity to lead your team to regain the Ashes? His performance would have been special and remarkable even without his knee problem. He thundered in from the Pavilion End, using the slope to his advantage, and he snuffed out any unlikely concerns that Australia might smash the record books by dismissing Brad Haddin with only his fourth delivery of the morning - via a beautifully taken catch at second slip by Paul Collingwood. That effectively sealed Australia's fate, and when Michael Clarke misjudged the length of Graeme Swanns second ball and was bowled for 136, it was merely a case of when England could celebrate their first win against Australia here for 75 years. The crowd was urging Flintoff to take his first five-wicket haul at Lord's, and having ripped out Nathan Hauritz's off stump when the off-spinner played no shot, he came off a shortened run and blew away Peter Siddle. Flintoff raised his arms in triumph, like a victorious gladiator and then, typically, told us that it had been a team effort. It was, of course, with Andrew Strauss's outstanding 161 setting it up, but there are fitness concerns over both Flintoff and Kevin Pietersen. It seems that both will take their injuries on a day-by-day basis, there is a good chance that both will make it through the series. Graham Onions also has an elbow problem. For Australia, the worries are about form rather than fitness with Mitchell Johnson and Phillip Hughes at the top of the list. Both teams will be relieved, therefore, for this week's breather before they meet again at Edgbaston next Thursday.